I've always been a fan of Delifrance's sandwiches! I love mixing and matching different meats and spreads to their soft breads. My favorites include the Norwegian Smoked Salmon on Ciabatta Bread (Php. 179) and the good ol' Crabstick Celery on French Baguette (Php. 139). 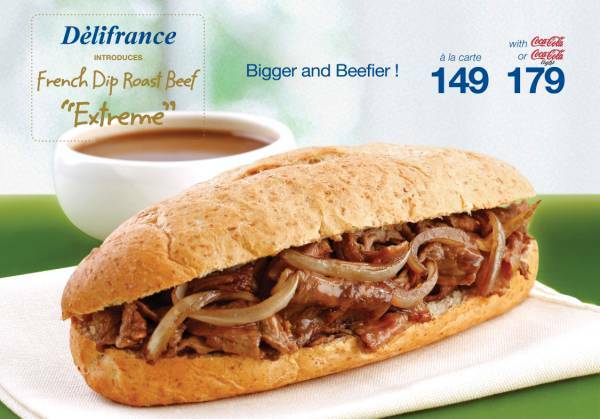 Lately, we're loving their newest sandwich offering, the French Dip Roast Beef (Php. 149) that's oh-so-sinful but very delicious that you couldn't resist but order this in every visit. I love it that their beef is quite lean and it's very flavorful. It's served with gravy but it's actually good even without it. I love dining at Delifrance not just for breakfast but for any time of the day. Delifrance has more than 20 branches in Luzon. The office where I used to work had a Delifrance nearby. I loved their santa's clubhouse combo on their Christmas season menu!